Provide comfort for the family of Janet Winn with a meaningful gesture of sympathy. Janet Elizabeth (Carey) Winn, 93, of Williamstown, Formerly of Mason Rd. 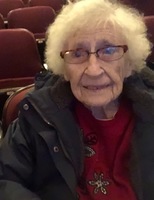 Pownal, Vt. died on Wednesday February 27, 2019 at her home surrounded by her loving family. Janet was born on December 21, 1925 a daughter of the late Harry & Elizabeth (Jennings) Carey. She attended Williamstown High School and graduated with the class of 1944. Janet then attended the University of Massachusetts and earned a degree in Chemistry in 1948. She was employed at Sprague Electric Research Center. Janet was last employed for many years at the Williamstown Public Schools as a Teacher’s Aide. She was a lifelong member of Sts. Patrick & Raphael Church, an active member of the Friendship Club at Harper Center, Volunteer for meals on wheels, and also a volunteer for the reading buddies program. Janet was the widow of John James Winn who died on April 22, 2015. They were married on January 24, 1950 at St. Patrick’s Church. Survivors include her children, Peter Winn, Margaret Winn, Nancy Hurley and her husband Joseph, Thomas Winn and his companion Wanda Jones, David Winn and his wife Pamela. She also leaves 8 grandchildren, 2 great grandsons. She was predeceased by her sister, Barbara Winn and brother Harry Carey Jr.
FUNERAL NOTICE: A Liturgy of Christian Burial for Janet Winn will be celebrated on Tuesday, March 5, 2019 at 11:00 AM at Sts. Patrick and Raphael Church, Williamstown, MA. Burial will be in the spring at Oak Hill Cemetery. Calling hours will be on Tuesday from 9:00 AM-10:30 AM at the Flynn & Dagnoli Funeral Home – WEST Chapel 521 West Main St. North Adams, MA 01247. Donations may be made to Hospice Care in the Berkshires through the funeral home. To add to the Book of Memories, please visit www.flynndagnolifuneralhomes.com. To send flowers in memory of Janet Carey Winn, please visit our Heartfelt Sympathies Store.